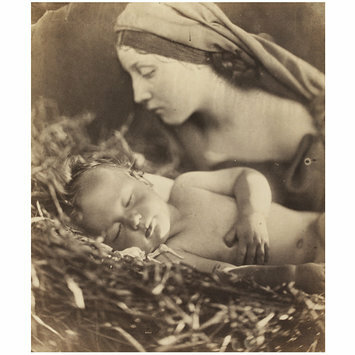 Like many of her contemporaries, Julia Margaret Cameron was a devout Christian. As a mother of six, the motif of the Madonna and child held particular significance for her. 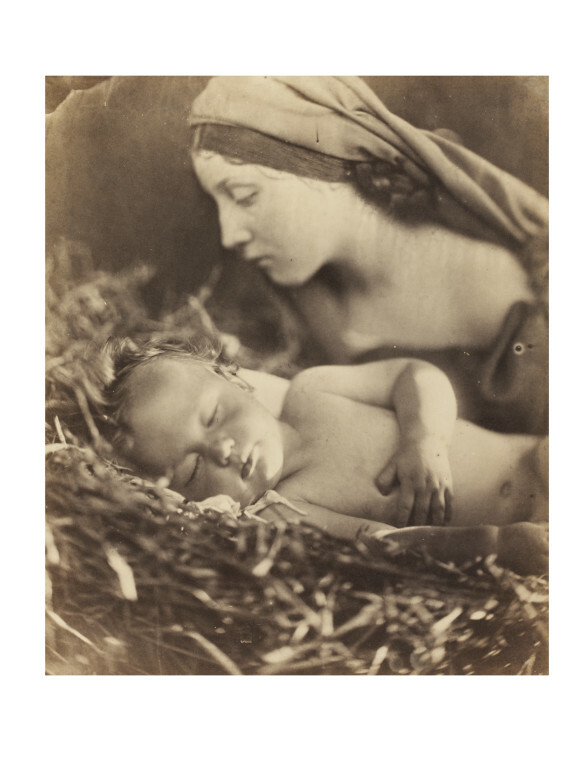 In aspiring to make ‘High Art’, Cameron aimed to make photographs that could be uplifting and morally instructive. The nest-like bed of straw evokes the manger in which the baby Jesus was lain. Strong light illuminates the baby’s bare skin. The composition is layered from top to bottom with assorted textures: soft folds of drapery, neatly braided hair, smooth skin, and a fluff of hair, which blurs into the rough straw. Cameron's friend and mentor, the painter G.F. Watts, wrote to Cameron, ‘Please do not send me valuable mounted copies … send me any … defective unmounted impressions, I shall be able to judge just as well & shall be just as much charmed with success & shall not feel that I am taking money from you.’ This photograph is one of approximately 67 in the V&A's collection that was recently discovered to have belonged to him. Many are unique, which suggests that Cameron was not fully satisfied with them. Some may seem ‘defective’ but others are enhanced by their flaws. All of them contribute to our understanding of Cameron’s working process and the photographs that did meet her standards. 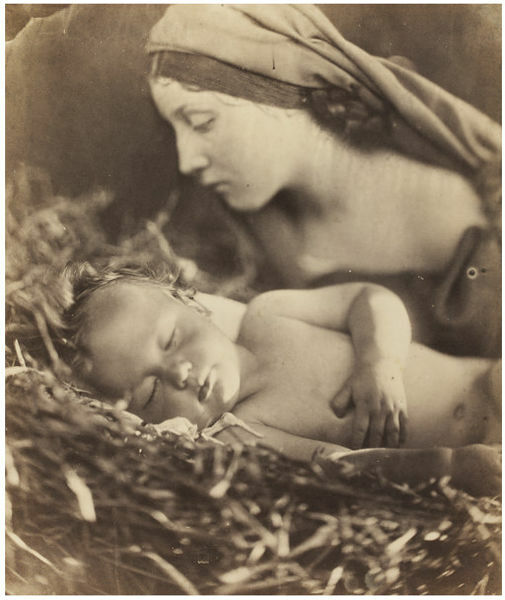 Photograph of a woman (Mary Hillier) with her head draped in cloth, looking over a sleeping infant (Percy Keown). She has her right hand on the infant's head. Julia Margaret Cameron's career as a photographer began in 1863 when her daughter gave her a camera. Cameron began photographing everyone in sight. Because of the newness of photography as a practice, she was free to make her own rules and not be bound to convention. The kinds of images being made at the time did not interest Cameron. She was interested in capturing another kind of photographic truth. Not one dependent on accuracy of sharp detail, but one that depicted the emotional state of her sitter. Cameron liked the soft focus portraits and the streak marks on her negatives, choosing to work with these irregularities, making them part of her pictures. Although at the time Cameron was seen as an unconventional and experimental photographer, her images have a solid place in the history of photography. Most of Cameron's photographs are portraits. She used members of her family as sitters and made photographs than concentrated on their faces. She was interested in conveying their natural beauty, often asking female sitters to let down their hair so as to show them in a way that they were not accustomed to presenting themselves. In addition to making stunning and evocative portraits both of male and female subjects, Cameron also staged tableaux and posed her sitters in situations that simulated allegorical paintings. Baby Rotterdam: Veenman Publishers/ Gijs Stork, 2008. ISBN: 90-8690-167-0.
cat. no. 127, p. 162.